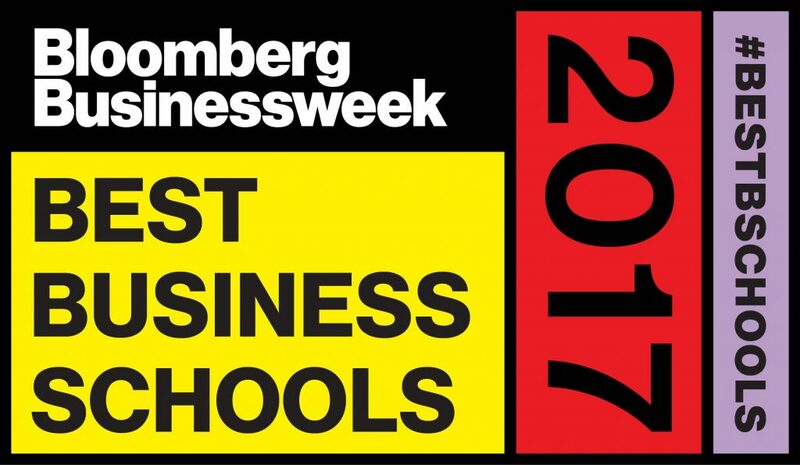 NEW YORK (November 16, 2017)—Bloomberg Businessweek today released its 2017 ranking of the best U.S. business schools, based on data compiled from more than 600 recruiters, 10,000 alumni, and 9,000 recent graduates. Harvard claims the number one spot among 85 full-time U.S. MBA programs. Pennsylvania (Wharton) is number two, and MIT (Sloan) is number three. This is the third year in a row that Harvard Business School came out on top. HBS was rated number one by recruiters, and number three among alumni. Its graduates left with the second highest salaries. The biggest gains in the top 20 were Pennsylvania (Wharton), MIT (Sloan), and Washington (Foster), all up by 4 spots. Climbing into the top 20 are UCLA (Anderson) at 19 and Texas-Austin (McCombs) at 20. New to the top 10 is Columbia, which rose from 11 to 9. Falling out of the top 10 was California-Berkeley (Haas), which fell from 10 to 11. Falling out of the top 20 was Texas A&M (Mays), which fell from 18 to 22, and Emory (Goizueta), which fell from 20 to 21. Interactive tables allow readers to dig into data points for each school, ranging from job placement for class of 2016 graduates to pay growth (pre-MBA, first job, and after 6 to 8 years). The top 30 full-time U.S. MBA programs will be highlighted in the print issue of Bloomberg Businessweek on newsstands Friday, November 17, 2017. Bloomberg Businessweek’s ranking of full-time U.S. MBA programs is based on five components: (1) employer survey (35 percent of total score), in which more than 600 recruiters named the programs that best deliver the skills they seek in MBA hires; (2) alumni survey (30 percent), in which nearly 10,000 alumni who graduated from 2009 to 2011 told us how their MBAs affected their careers, their compensation over time, and their job satisfaction; (3) student survey (15 percent), in which 2017 graduates (9,461 responses) rated their programs; (4) job placement rate (10 percent), or how many MBAs seeking full-time jobs get them within three months of graduating; (5) starting salary (10 percent), or how much new MBAs make in their new jobs, adjusted for industry and regional variation. Data from the 2016 ranking were added to the survey components to diversify feedback. Bloomberg Businessweek offers a global perspective, timely insights, and unique stories to a new breed of business leader who has an original vision for the future and a willingness to think differently. Founded in 1929, the magazine is a trusted market leader with a global circulation of 1.5 million and is available in more than 150 countries. Bloomberg Businessweek covers the business world like no one else can by drawing on more than 2,700 journalists and analysts in more than 120 countries.